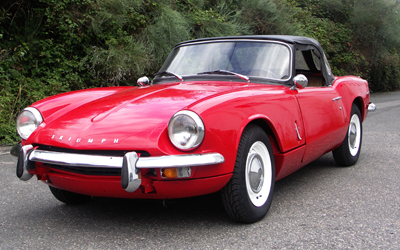 Instantly recognisable by the raised front bumper (by nine inches) that adds a hint of Lotus Elan, the MkIII Spitfire may count as the only car in history to have its looks improved by trying to meet American regulations. The soft-top is also much improved, in both looks and ease of operation. But the best change lies under the bonnet: a 1296cc engine with an eight-port cylinder head based on the FWD Triumph 1300 unit. This adds up to a 12% power increase (with better economy), so a stronger clutch and larger brake calipers join the party, along with stiffer front springs.